Pam is a community volunteer after having taught high school Biology and 6th grade science for 27 years. She is enthusiastic and encourages students to see how all the sciences are interconnected. 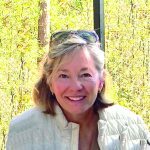 She currently serves as a docent at the Birmingham Museum of Art, has previously served on the board of McWane Science Center, and is currently on the board for the Birmingham Holocaust Education Center.